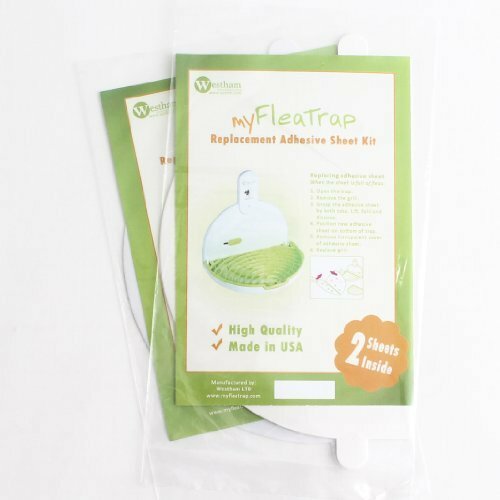 The myFleaTrap Refill Kit (2-Pack (4 sheets)) are designed for use with the myFleaTrap. The non-poisonous adhesive sheets feature an adhesive that holds fleas in place in order to help control and avoid flea infestations in your home. These flea trap refills have a sweet odor inserted in the specially formulated sticky sheet. Fleas don't stand a chance. Our flea traps lets pet owners see results. The non-poisonous and odorless trap refills enable safe placement of the flea trap around children and pets. Made in USA. Very high quality. If you have any questions about this product by MyFleaTrap, contact us by completing and submitting the form below. If you are looking for a specif part number, please include it with your message.